In this episode “Apprentice,” we learned what the hat in the box is for and a lot questions sprang up about what Rumple is doing and what his end plans are. We also got an introduction to a power struggle that is going to go on between Hook and Rumple. They both want to take each other out and believe that without the other they can have the happy ending they desire. I have a feeling much of at least the first half of this season will be these two continually shoving at each other trying to take the other one out. This episode opened with the dark one before Rumple trying to steal the box with the hat in it from the apprentice. He does not succeed because of an enchantment on it that says that only those who have no succumbed to the darkness inside themselves can have the box. The apprentice says that every dark one has tried and has failed because of this exact reason. What this box holds is a hat that when it is charged it makes the wearer or the one who possesses it invincible and all powerful. Rumple and all the other dark ones want it because even thought they have this extensive power they are tied to the dagger. Whoever possesses the dagger controls them. Rumple desires more than anything to be completely free. Rumple found the box in the house where he and Belle honeymooned. Whose house is this? Is it connected to Anna is some way? Anna was the last one we saw to have the box and if she lost it who did she lose it to? And is this all connected to Ana being missing? Is she really missing? Also did Rumple comes to this house because he knew the box was there? Was this all part of some bigger plan of his? If this is some bigger plan what does Rumple want with this power? He spent much of last season saying that he changed and he wanted to live a better life for his son and Belle. Now that Neil is dead has his way of thinking seems to have changed. We can see plainly that no matter how many times he says he has changed that is not completely true; if it was he was he would not be being capturing people in this hat. Belle doesn’t even have the real dagger because Rumple can not relinquish control over himself to anyone. He can not let anything be able to hold him back. So does he want this hat so that he can be completely free and not have to worry about the dagger? So he charges the hat and gets away from the dagger then what? He is not going to just sit around with all this power and not use it in any way. He has a plan for it and he has an endgame as he alway does, we just haven’t gotten enough clues to find out what it is yet. Rumple can keep talking about being a changed man but until he really steps away from the power of the magic inside of him he will never be able to live free. Rumple is his own worst enemy right now. Rumple loves to manipulate people. He will always make deals. Hook came to him in this episode to get his hand back. He wanted to have both hands so that if his date with Emma went well he could truly hold Emma. He wanted to be whole for the woman he loves. Rumple agrees because Hook blackmails him with his knowledge that Belle does not possess the real dagger. Rumple tells him thought that the hand is from the old Hook and that if he reattaches it, it could reawaken the man Hook once was. Rumple warns Hook that he could become the angry and selfish pirate once again with the hand. Hook refuses to believe him and let’s Rumple reattach the hand. Out on his date with Emma we see Hook lose control a few times. He ends up beating Will Scarlett pretty badly when he gets caught breaking into the library. Hook is instantly afraid because he thinks that Rumple was right. He always looks to his hand as if the hand made the decision to lash out at someone and not Hook himself. He puts all the blame on his hand and has to enter into a new deal with Rumple to get his hook back and get rid of the hand. Hook is terrified that with the hand he will go back to the man he once was. Rumple gives him back his hand and then only reveals that he was lying the whole time. The hand is just flesh and bone and nothing more, the actions that Hook did were all his own. Rumple knew exactly what he was doing when he told Hook about the hand. The power of persuasion is something that we all know about. That commercial that tells you that your computer or phone is out of date and needs to be replaced or you can’t keep up with the world. This idea can control people is so many different ways. All you do is put the thought into someone’s head and let it grow. If you tell someone that by doing action A they will cause B, even if the two are not connected in any manner, B will happen nine times out of ten. And it is only because you have that idea in your head. You start making choices based off of this assumption and before you know it B takes place. Hook was told that by reattaching his hand he would become angry, violent and selfish once again and because Rumple stuck that idea in his head it happened. Hook has been working to push those thoughts and actions to the very back of his mind for a while now. He has been working not be that person but one reminder of his past and it is all over. He assumes that he can’t escape his past and because he believes that he never will escape the man he once was. If Hook really wants to change he can, he just needs to believe that he can. For every person who says he can’t be a good man he needs to step up and tell them off and prove them wrong. He can’t let those thoughts and ideas swim around in his head because they take root and they influence his actions. Hook needs to believe in himself or else he is going to lose himself. Rumple manipulated Hook because he seems to need him for something. He has some bit plan and he needs someone to help him. Hook is stubborn and strong and Rumple sees how useful he can be. 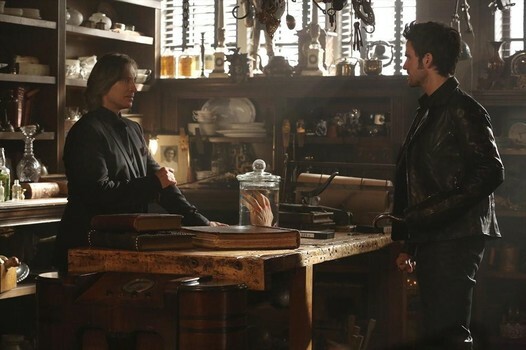 Hook enters into a deal to help Rumple but this partnership is not going to be a smooth one. Both Rumple and Hook not only hate each other but have no respect for one another. They are constantly trying to take out the other one. Hook threatened Belle so Rumple threatens Emma. They know exactly how to hurt the other one and neither is willing to let themselves be hurt or the one they love to be hurt. Hook is not going down without Rumple at his side. If this all implodes on itself they both are going to get hurt. Neither will walk away from the other. Hopefully they don’t destroy each other in the process. The other major part of this episode was Henry being determined to help Regina get her happy ending. This episode reminded us that Henry is still a child and he thinks along those lines. He still has the child way of looking at something and thinking that a solution is easy, simple, black and white. Robin Hood still loves Regina so that is great for them right? Regina tells him that ,“There are somethings you are too young to understand.” And she could not be more right. What is going on between Regina and Robin Hood is much more complicated then just true love finding a home. There are so many grey areas and questions that Henry doesn’t understand. Which is why him helping Regina with the book may not be the best thing. Henry thinks that happy endings are neat and tidy. He says that Rumple is married to Belle so he must have a found a way to get his happy ending and change the book. But Rumple does not have a happy ending right now. He has Belle but the rest of his life is a mess. The question becomes what makes a happy ending? As I stated before many of these characters may have all the pieces they needs for their happy endings they just don’t see how to put them together right now. I feel like Henry is going to be very upset and disappointed when he learns that getting a happy ending for Regina is not going to be simple and easy. “Nothing can change me back,” – Hook- The only thing that can change him back is Hook himself. If he fights to be the good man he wants to be then he can win. If he lets Rumple and others stay in his head, he is doomed. “Love is a weapon. Always has been. Just so few people know how to wield it,” – Rumple and Anna – This is a very important exchange. Love is a very powerful weapon, something Ana has already seen with her sister saving her. It all depends on how you use love. You can use it to save those you love or you can use it manipulate people and destroy. Love is a powerful weapon made more powerful by the person using it. Can Hook block out all those voices and be able to find the good in him and live through that side of him? Does he have enough faith in himself to win this fight? Will Rumple and Hook working together destroy the both of them in the end? Can Hook let his love for Emma and his desire to be good win out over the darkness he still holds inside himself? Whose house had that box? Ana’s? Someone else connected to Elsa and Ana? What are Rumple’s plans for the box? To get pure freedom? Something bigger? Defeat someone? 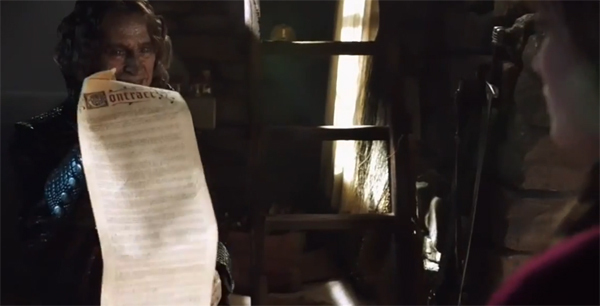 Will Henry being Rumple’s apprentice be a good or bad thing? Is this arrangement going to help Henry grow or is it dangerous for him? Does Rumple really have a happy ending right now with Belle? Is his refusal to see that going to destroy everything? When does this all take place in connection to Once Upon a Time in Wonderland? What is Will Scarlet’s story? What happened to the red queen? Posted on October 20, 2014, in Once Upon a Time and tagged happy ending, Hook, Once Upon a time, Regina, Rumple, The Apprentice, tv show review, writing. Bookmark the permalink. Leave a comment.